Welcome to the informational Heat Licensing website! Heat Licensing was founded in 1996 to become one of the premier licensing companies servicing all of the entertainment community. Since then, we have focused Heat on servicing the very rapidly growing licensing industry. 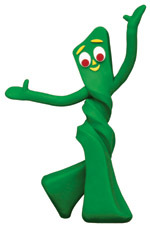 We currently license Gumby & Pokey. If you have comments or questions about our properties or services, or simply need more information about licensing, please contact us. For information about licensing Bela Lugosi, please contact Lugosi Enterprises at info@lugosi.com.